many too many will be too young to recall or even have heard of hill street blues, an american cop show that first aired on nbc in the states in 1981 and subsequently ran for 146 episodes until 1987 (co-incidentally, the year i moved to islay). created by steven bochco and michael kozoli, and like many a police drama, it concerned an unnamed police precinct in an unnamed american city, with many of those appearing frequently engendering calls of 'wasn't he in...? when watching subsequent american television programmes. such was its influence on the television viewing public, one episode listed 49th on tv guide's '100 greatest episodes of all time'. i could even hum the theme tune right now if you want? for those with no idea whatsoever of which i speak, you might want to take a click over to amazon and lighten your wallets by ordering each season on dvd. though many a police and crime series has emulated certain aspects of the scene setting and antics of hill street blues, the series is particularly famous for one repetitive quote from sergeant phil esterhaus. in order to give viewers an indication of the episode's modus operandi, the station's detectives, sergeants and officers would be gathered together in the briefing room and given an overview of how they would be spending their immediate future. aside from frequent stops for donuts. and just as a simple aside at this point, when in new york in 2002, i took the opportunity of a return ride on the staten island ferry, past the statue of liberty and across the water to, of all places, staten island. my delight in finding that the trip was entirely free was further bolstered by the discovery that donuts were sold on the boat. how could i resist? unfortunately, post first bite, i was wishing that i had resisted, for it was disgusting. while i wouldn't wish to condemn the american donut entirely on the basis of one purchased on the staten island ferry, i think that those built in the uk could easily show america a thing or two. how could those american cops, fictional or otherwise, bring themselves to eat so many every day? anyway, to return to the obscure thread of my opening narrative, after the briefing was concluded for the day, sergeant esterhause would sign off with an earnest "hey, let's be careful out there." considering the animosity shown towards these fine men in uniform by the residents and oft times visitors to the precinct, it was a watchword well made. doubtless many a spouse ought to have their loved ones depart of a morning for the daily commute regaled by a similar espousement; the level of motorised traffic on the roads these days seems not to be diminishing. and it cannot have escaped you attention that many are driving in a little bubble that seems concerned only with their specific route to work, effectively discarding the needs of those round about them. however, that is a scene set regularly each day, and one that has doubtless been analysed to excess in places far more qualified to do so than by one whose irregular commute is likely only to be interspersed with stray sheep and cows. there is a different level of 'let's be careful out there' in force around these here parts, it rests more heavily on being able to rescue a mechanical situation should one occur miles from anywhere. i am not ignorant of the same hurdles befalling those in a more urban cycle setting, but in such there is likely to be greater access to some form of public transport, nearby bike shop or perchance a cycling samaritan. i have, on more than one occasion, seen sight of a mobile cycle workshop travailing the streets of london, eager to assist the mechanically helpless. strange to relate, few sheep around the isle, or other rural parts, seem to have received training in bicycle maintenance, nor are possessed of a supply of inner tubes. it therefore is incumbent on the velocipedinist to carry emergency supplies. the rapha continental, despite their irritating good fortune to almost always have a minibus or sram support vehicle in the immediate vicinity, is composed of hardy gentlemen well-versed in the art of fixing a flat, replacing a cable and tightening recalcitrant allen bolts. it sort of goes with the territory. 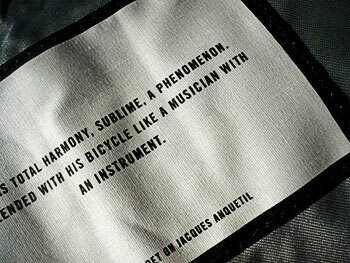 in order to aid and abet this self-sufficiency, each rider is supplied with a wrapover under saddle pack, cunningly designed by carey s-h, formerly of rapha usa, and now with james selman's weights and pulleys. i was most fortunate to have received one of these official issue items from slate olson a good few years ago, and it has been in constant service ever since. 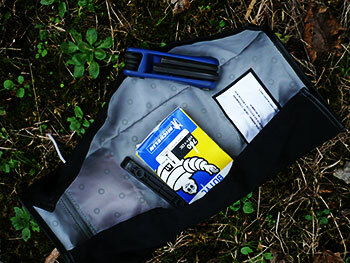 this original version had a tough, black cordura outer and an identifiably rapha pink interior. opened on the floor it consisted of an oblong of the waterproof material that could be rolled over an inner tube, tyre lever and a crank bros. multi-tool, then secured in place with a leather toe-strap. as my bicycle collection increased, it became a bit of a footer to keep shifting it from one bicycle to another, and there has been more than one occasion on which i have left home without it, memory having deserted me at a point when i'd really rather it hadn't. so i wrote to mr olson to ask if he would be so good as to send another; unfortunately, at that point, supplies had been exhausted. thankfully, rapha uk have not remained oblivious to either the efficacy of carey's original invention nor to the latent demand for more of the same. as with many a good idea, time has allowed for a modicum of development, and perren street has recently released an updated version of the same, slightly more refined for the less adventurous, more conservative peletonese. this new seat pack has turned the original through ninety degrees, still relying on a now rapha monogrammed toe strap to retain its integrity when secured to those saddle rails. 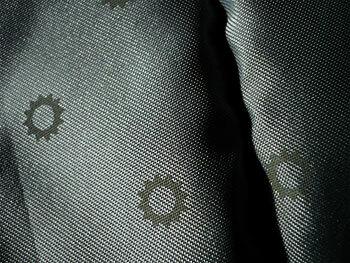 instead of a simple shape of appropriate fabric, the production version is pre-folded offering a base on which to place the necessary tools with flaps on each side to keep the latter safe from the elements. the edges are now framed with leather edging. the white colouring of the toe strap matches well with the colour scheme applied to the rest of rapha's luggage range, ensuring a level of style even when splattered with mud (as mine was after a weekend of cyclocross-like activity). the twist in the tail is the added extra, allowing for the carrying of an emergency fiver or tenner (or equivalent in dollars, euros etc.) 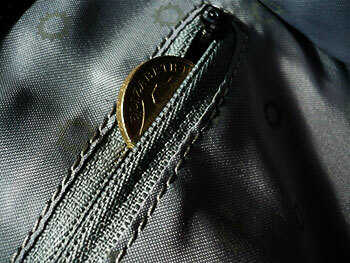 inside a zipped inner pocket. damn clever. i cannot deny that i have a soft spot for the original continental seat pack that still inhabits the underside of the leather saddle on my cielo, but i am not without an appreciation of some of the finer things in life, such as this latest edifice which keeps me safe out there. 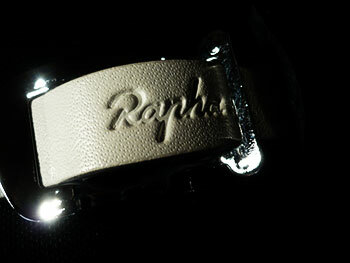 rapha's seat pack retails at £40 and arrives complete with rapha embossed white toe strap.